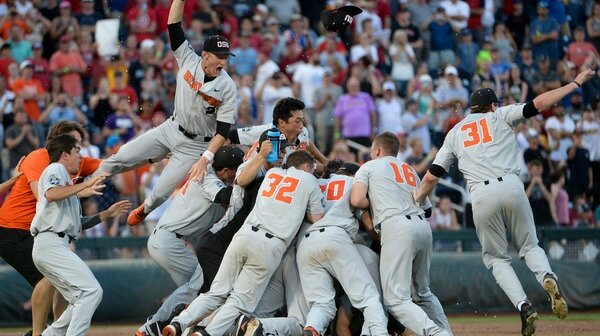 A five-year streak of college baseball teams picking up their first College World Series titles ended last week with Oregon State winning its third national championship in program history. That 2013-17 stretch marked the longest consecutive run of first-time winners since there were five new champs from 1952-56 to close out the first decade of tournament play. We start with the 2018 runner-up, who came one foul pop-up putout away from sweeping Oregon State and keeping the streak of first-timers alive. Instead, the Beavers rallied for a miraculous Game 2 win and shut down the Razorbacks in Game 3 to send the Arkansas faithful back home to Fayetteville empty-handed. But despite boasting a school-record 11 draft picks, the Razorbacks will return some heavy firepower to a lineup that averaged 7.7 runs per game in their first three CWS games before running into Oregon State. Arkansas returns a trio of all-College World Series selections to the lineup in Casey Martin, Dominic Fletcher and Heston Kjerstad. No trophy can compare to the BEST fans in college baseball. Martin and Kjerstad combined for 27 home runs and 107 RBIs while sporting the teams' highest batting averages and most hits (both had 87) as freshmen. Fletcher, a rising junior, batted .288 with 10 homers and showed excellent defensive range in center field. Arkansas will also have an influx of new arms in 2019 as it tries to replace staff ace Blaine Knight, who finished the season 14-0 with two wins in Omaha. The Razorbacks have finished runner-up twice in school history (1979, 2018) and have reached the CWS three times this decade as the pursuit for their first title continues. Clemson has qualified for the NCAA tournament each of the past 10 years and 31 of the past 32 years. Its most recent CWS appearance came in 2010. The 2019 Tigers lose first-round draft pick Seth Beer and three more of the top seven RBI men from last year. In their place, shortstop Logan Davidson (15 homers, 46 RBIs) steps up as a main power threat while a young pitching staff looks to build on experience gained in 2018. Brooks Crawford, Jacob Hennessy and Spencer Strider likely figure to be part of the weekend rotation plan. Clemson hosted a regional for the third straight year in 2018, but lost to Vanderbilt in the regional finals. The Tigers have advanced to the CWS on 12 occasions with zero finals apperances. How fitting would it be for Mike Martin Sr. to capture that elusive first title in his 40th and final season at the helm of Florida State? Martin took over the Seminoles in 1980 and has turned FSU into a college baseball powerhouse with 39 consecutive trips to the tournament, 16 CWS appearances and two runner-up finishes (1986, 1999). In May, Martin became the all-time winningest DI baseball coach with his 1,976th career victory at his alma mater. But the trophy case remains empty in Talahassee. Florida State put together a 43-win season and hosted a 2018 regional where it was ousted in two games, thanks to a walk-off home run from Mississippi State's Elijah MacNamee. The Seminoles have won the past two ACC championships, and three out of the last four. FSU's softball team broke through for its first national championship in 2018. Maybe 2019 is the year for the school's storied baseball program. The rally banana came up just short in the CWS semifinals, but 2018 was truly a magical season for Mississippi State. The Bulldogs started conference play 2-7 and barely squeezed into the SEC tournament field. 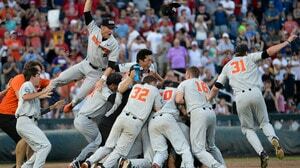 Then, somehow, they were one of the final three teams left standing in Omaha. MacNamee was the postseason's breakout star with a pair of walk-off homers on the road to Omaha, and he'll look to build on that success next year as a senior. Perhaps more importantly, MSU's leadoff hitter and center fielder Jake Mangum (.351 average, 63 runs) elected to return for his senior season and will be a centerpiece of the Bulldogs' offense. Chris Lemonis will be the new man at the helm of the Bulldogs, as he was announced the replacement for interim head coach Gary Henderson. Lemonis comes over from Indiana, where he led the Hoosiers to three NCAA tournament appearances in the past four years as head coach. This past season marked MSU's 10th CWS trip in program history. The closest the Bulldogs have come to lifting the hardware was in 2013, when they lost to UCLA in a two-game finals sweep. After a shocking regional exit last season as a No. 2 national seed, coach Mike Fox led the Tar Heels back to Omaha in 2018 for the first time in five years. Michael Busch (.317, 13 homers) and Ike Freeman (6-for-13 in three CWS games) will return to a potent UNC lineup that ranked 13th in the nation in runs scored. The Tar Heels will also wait to see if leading hitter Kyle Datres opts to return to the top of the order after being drafted in the 12th round by the Colorado Rockies. Much of UNC's success on the mound will hinge on ace Gianluca Dalatri's health. After missing much of the 2018 regular season due to elbow issues, his injury flared up again in the first inning of his first CWS start. North Carolina has won 43 total NCAA championships across seven sports — none coming on the baseball diamond. The Tar Heels have been to 11 College World Series and finished runner-up twice in a row in 2006-07 to repeat champ Oregon State. Stetson reached new heights in 2018, as it hosted its first regional in DeLand and advanced to its first Super Regional in school history where it was ousted by UNC in two games. Losing first-round pick and staff ace Logan Gilbert is an obvious hole to fill in 2019, but the ASUN champs are set with experience and depth entering next year. Seven of the nine starters from the 2018 lineup return, with the two losses being designated hitter (and closer) Brooks Wilson and catcher Austin Hale. Mike Spooner and Jon Meola will be two important seniors on next year's young squad that also returns contributing freshmen and sophomores. Meanwhile, pitching depth will be key to the Hatters' maintained success, despite the absence of the ultra-talented Gilbert. Southpaw Mitchell Senger should step into the role of ace after posting a 9-2 record with a 2.51 ERA and 114 strikeouts in 2018. Unlike the other big names on this list, Stetson faces the challenge of making it out of a likely one-bid league with little room for error. It's been done before though — just look at 2016 first-time national champion Coastal Carolina. The Red Raiders don't have a long history of CWS success, but they sure have a recent history. All three of Texas Tech's trips to Omaha have come in the past five seasons, coinciding with coach Tim Tadlock's taking of the reins in Lubbock in 2013. TTU advanced to the 2018 CWS despite losing ace Steven Gingery to an early season-ending injury. Of course, a .309 team average and 82 home runs — both ranked eighth in the nation — will help make up for a loss of that stature. Leading the Red Raiders' charge were freshman Gabe Holt and sophomores Josh Jung and Grant Little. Holt was one of the premiere leadoff men in the nation in 2018 with a .348 average and a 29-of-30 stolen base conversion rate. Jung and Little each hammered 12 homers and drove in 80 and 77 RBIs, respectively. With all three returning, Texas Tech is set up with one of the more formidable offenses in DI baseball entering 2019. 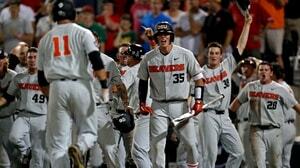 This year's CWS was the first time Texas Tech started its Omaha run in the winner's bracket. But two straight losses to SEC foes Arkansas and Florida closed the book on their 2018 season.